for general vectors and . Is invariant under transformation, as must be the case if it is a scalar number? Let us consider an example. Suppose that and . It is easily seen that . Let us now rotate the coordinate axes through about . In the new coordinate system, and , giving . Clearly, is not invariant under rotational transformation, so the previous definition is a bad one. The associative property is meaningless for the dot product, because we cannot have , as is scalar. So, the invariance of is equivalent to the invariance of the magnitude of vector under transformation. 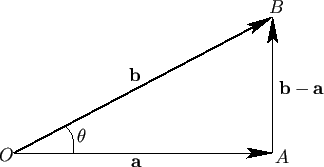 Figure A.6: A vector triangle. The work performed by a non-constant force that moves an object through an infinitesimal displacement in a time interval is . Thus, the rate at which the force does work on the object, which is usually referred to as the power, is , or , where is the object's instantaneous velocity.